It is often said with justification that "The Clyde made Glasgow and Glasgow made the Clyde." Without the river and its access to the sea, Glasgow might never have grown to become Scotland's largest city. But the Clyde started as a shallow salmon river which, over the years, was dredged to make Glasgow into a major port with sea-going vessels sailing right into the heart of the city. In addition to imports, Glasgow's manufacturing output was exported via the Clyde, including 50,000 locomotives from Glasgow factories. Despite the narrowness of the river, the banks of the Clyde used to be one of the largest shipbuilding centres in the world. During the 19th and 20th centuries 30,000 ships were built on the river. There is a long tradition of Glaswegians sailing "Doon the watter" to the coastal resorts on the Firth of Clyde. Steamers used to sail from the Broomielaw with day trippers and those going to places like Rothesay and Dunoon for the "Glasgow Fair" (the traditional two weeks in July when Glasgow's industries closed down). Only the Waverley paddle steamer keeps that tradition alive but there is now also a water-bus service from a jetty at the foot of Jamaica Street which runs to the Braehead shopping centre. Glaswegians and vistors alike can thus get a unique perspective on the city. 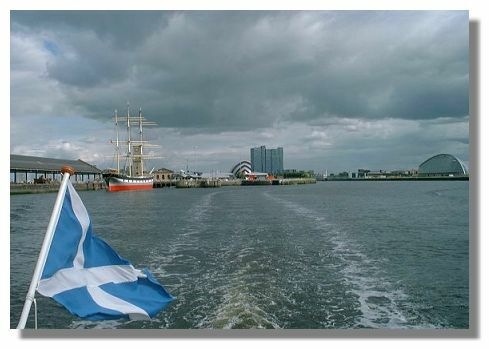 In the picture above, the "Glenlee" on the left is moored at the Clyde Maritime Centre. In the centre is the Moat House Hotel and the unusual shape of the Clyde Auditorium. On the right is the Glasgow Science Centre. Or return to the Glasgow Photo Library Index.